Sometimes relevance requirements are very complex and creates performance issues during execution. There is a very nice feature Introduced in Solr 4.9 called “Query Reranking/Rescoring” (SOLR-6088) which allows us to run query with a less costly relevance algorithm which contains simple query first and then re-rank the top N documents by a more costly algorithm with complex query second. Here we are applying costly ranking algorithm to top N documents only. It will have less impact on search performance. But we need to choose first query very carefully because the documents which score very low using the first simple query may not be considered during the re-ranking phase, even if they would score very highly using complex query. The re-ranking is, therefore, a two-stage scoring mechanism and the “expensive” scoring calculations are generally applied in the second step, where only limited documents are involved. We can use “rq” request parameter to specify the ranking query. The “rq” parameter should contain query string that produces a RankQuery. It’s very easy to use the “rerank” parser provided with Solr. It wraps a query specified by a local parameter, along with additional parameters indicating how many documents should be re-ranked (reRankDocs), and how the final scores should be computed (reRankWeight). 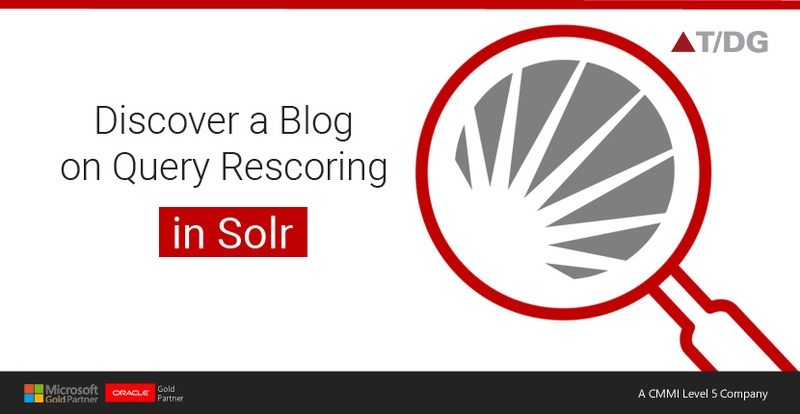 reRankQuery (mandatory) Solr query that is used for the re-ranking – in most cases a variable will be used to refer to another request parameter. The above example finds all documents that match on the query “Digital group”, and changes the ranking of the top 1000 documents. Documents that also contain “solrcloud” get an additional weight of 3. Re-Ranking is a great way of scoring documents dynamically if there are performance issues in ranking documents. Re-Ranking is not the solution to adjust the scoring, but this feature will be very helpful in many situations.